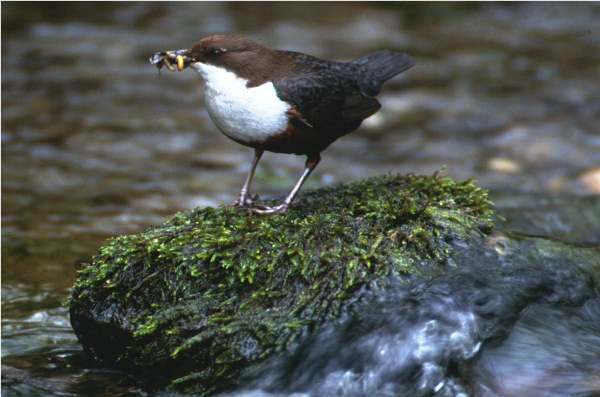 Dippers have developed the ability to walk under water. They feed on nymphs and larvae of insects, collecting them from among the moss and small stones in shallow margins of fast-flowing rivers and streams. Stonefly larvae and caddis grubs make up a large part of their diet, but they will also eat water-snails and fish fry. 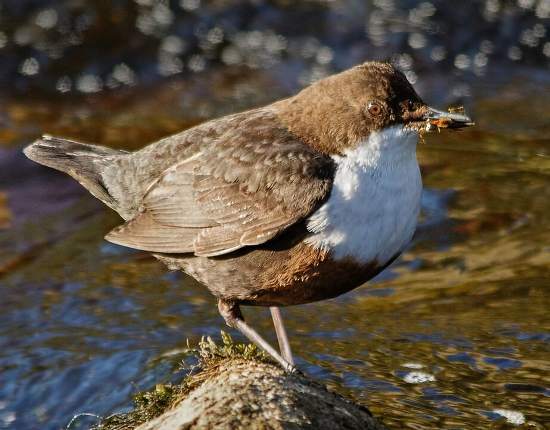 The presence of dippers on upland streams and on the rocky shores of lakes is a reassuring sign that the water is not being polluted by sheep dip chemicals or other farming pesticides. 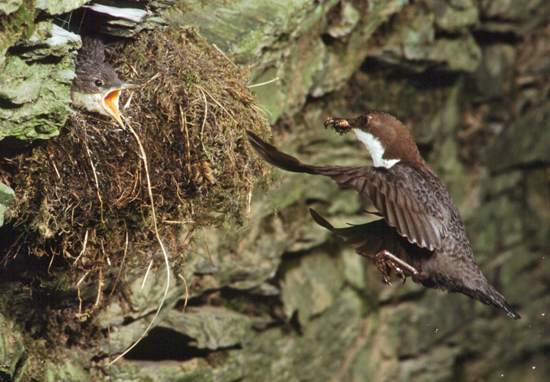 You will often find dippers' nests attached to the stonework of old bridges or walls beside small streams. Four youngsters is a typical hatch; there are four in the nest shown above and they all survived and left the nest in the last week of May 2001. The best way to see dippers is to sit still beside a wooded hill stream: like kingfishers, these busy birds cover quite a lot of territory in the course of their foraging and you will often see them flying up and down the stream, almost skimming the surface. Occasionally you may see a dipper alight on the water and then swim to the bank. We photographed and filmed this dipper feeding its young in a nest beneath a roadbridge over a small stream in West Wales.